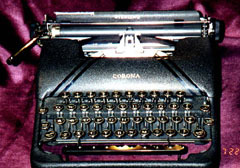 TY-353-All black Corona. In great condition. The heavy little machine weighs 16 lbs. There is not a scratch on it. There are 2 satin finish stripes on each side on the front. Looks like it has never been used. Comes with its own case which is also in great condition. This looks as if someone left this inside a closet because it looks as if no dust ever settled on it. $85.